Packing Way: a). Coil weight :50kg~800kg per roll , all available. Quality low carbon steel wire used in producing of hot-dip galvanized wire, going through wire drawing, acid washing, rust removing, annealing and coiling. Zinc coating ranges from 20g to 500g, and can be different according to customer’s specific requirements. The maximum weight for single coil hot-dip galvanized wire can be 1000 kg and all weight in the scope available. This kind of wire is extensively used in construction, handicrafts, woven wire mesh, express way fencing mesh, packaging of products and other daily uses. Low carbon galvanized steel wire :1006, 1008, Q195.etc. High carbon galvanized steel wire : 55#,60#,65#,70#,72A,80#,77B,82B.etc. a. Diameter : 0.1mm ~ 6.0mm, All available. b. Zinc coating weight : 100 ~ 500 gram/m2 . c. Tensile strength : Low carbon wire: 290 ~ 1200 MPA. 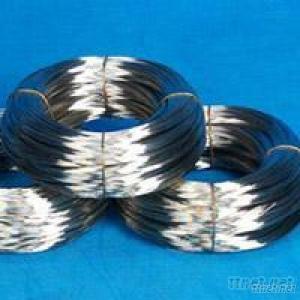 High carbon wire: 1000 ~ 1870 MPA. d. The specifications are in confirmity with customers' requirements or relevant standards. Note that : Our products are produced according to your special demands or the relevant standards. So that please inform us your specific requirements.